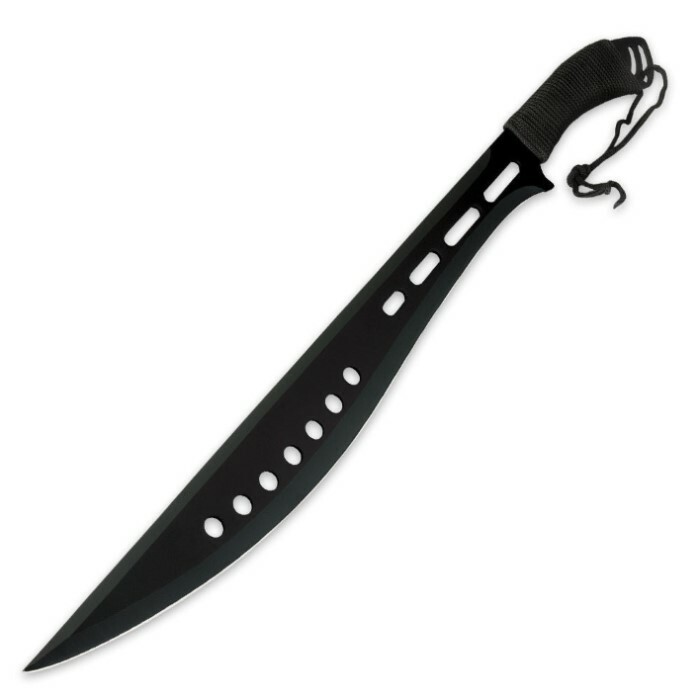 Whether you are embarking on a warrior's trek into a post-apocalyptic wasteland, or just heading out back to slash apart some water bottles, our Blackout Bolo Machete has you covered! Full tang and sharpened, this machete is forged from a single piece of stainless steel and sports an 18 1/2 in. cutting edge. Futuristic cut-outs adorn the blade while the handle is wrapped in black cord for a secure grip that helps with impact absorption. 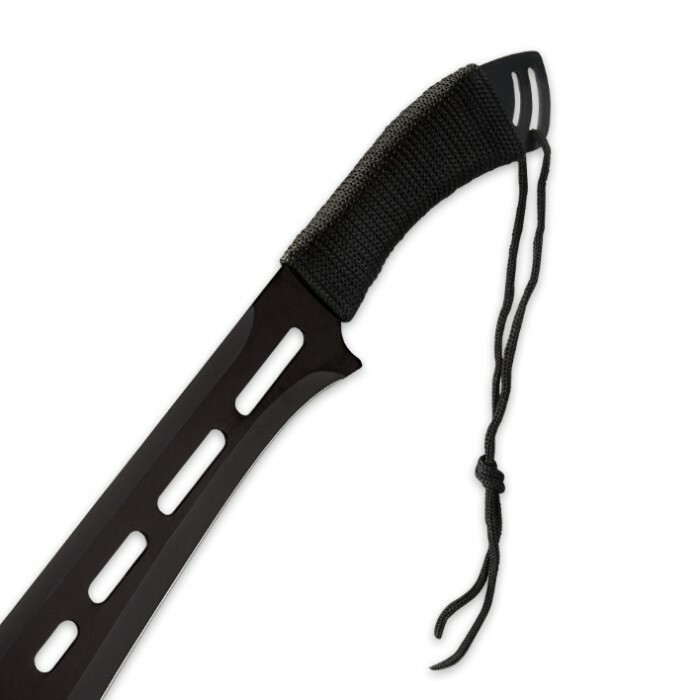 Includes black nylon sheath with carry strap. Measures 25 in. overall. This machete is light weight and comfortable to hold. The blade is very sharp and will get the job done. I used it for hacking at some branches on a tree and was very impressed. The nylon cord is tight and firm on the handle, There is two pieces of wood on the inside of the cord to give it a better grip and more comfortable when holding. It looks really cool and makes me feel that I am ready for the apocalypse and would really scare an attacker if they saw you holding it. Very impressed and would totally buy a second one for dual wielding. This long solid one piece blade is very nice for being so inexpensive. The cording is done perfectly. It came sharp and the blade cutouts are smooth. It is on the thin side and is a little flexible. Made in China and the quality sheath comes with an adjustable shoulder strap. Overall, this knife is a ton of intimidation power for a mere $10. So I ordered a pair of these as part of my apocalypse set, and I must say these are pretty good. They are not too heavy feel good in the hand and I can swing them pretty easy. Down side is they do not like to redirect midstroke. It appears that they are made out of a type of spring still which isn't nessarily a bad thing but they do look a bit thin about the thickness of a cleaver. The strap is JUNK cut it off! The sheath is pretty good itself though I wish it didn't have that witch symbol on it I cut it off. You will have to modify the handle I just added some charnocrylite adhesive to mine. I was kinda worried when I shook one I heard it sound like it was cracking. Otherwise not to bad a blade. I am extremely satisfied with this model of machete. But the wrap around the handle is only secured by a small amount of glue that needs to be re-secured every so often. Which is why I gave it a four star rating. The only problem with this particular model in my opinion is the glue securing the wrap. It either needs a little more glue or a different style handle wrap. if yo are looking for something sharp this is it! i was cutting soda cans and milk jugs no problem i cut my finger right when i was cleaning it. I bought my first sword from True Swords, maybe 4 or 5 years ago. Since then, I've educated myself quite a bit on what constitutes a good blade. While I still have a lot to learn, I feel confident I'm making solid decisions when I make a purchase. I feel this is a good purchase. While many blades are claimed to be shipped sharp, this one actually is SHARP. This machete is the first blade to cut me in many, many years. Without looking, I reached for the hilt and grabbed the blade instead, cutting my thumb nearly to the bone. It barely took any pressure to do so. For a stainless steel blade, it holds up very well. It's light and balanced well, so it won't fatigue you. I couldn't guess what would happen in duel, were you to parry and defend with it, but for everyday tasks it's a solid piece of equipment. It retains its edge well, and so far, unlike many inexpensive blades I've purchased, the cord on the hilt has remained intact. The sheath is a standard nylon sheath, stiff for easy drawing and sheathing. I agree with previous commentor, though: a back strap would be nice. That does not take away my enjoyment of the machete. All in all, I love it. It has become one of my favorite pieces, and were I to need something to defend myself with (short of a firearm) it is the first thing I would grab. This blade is so amazing! 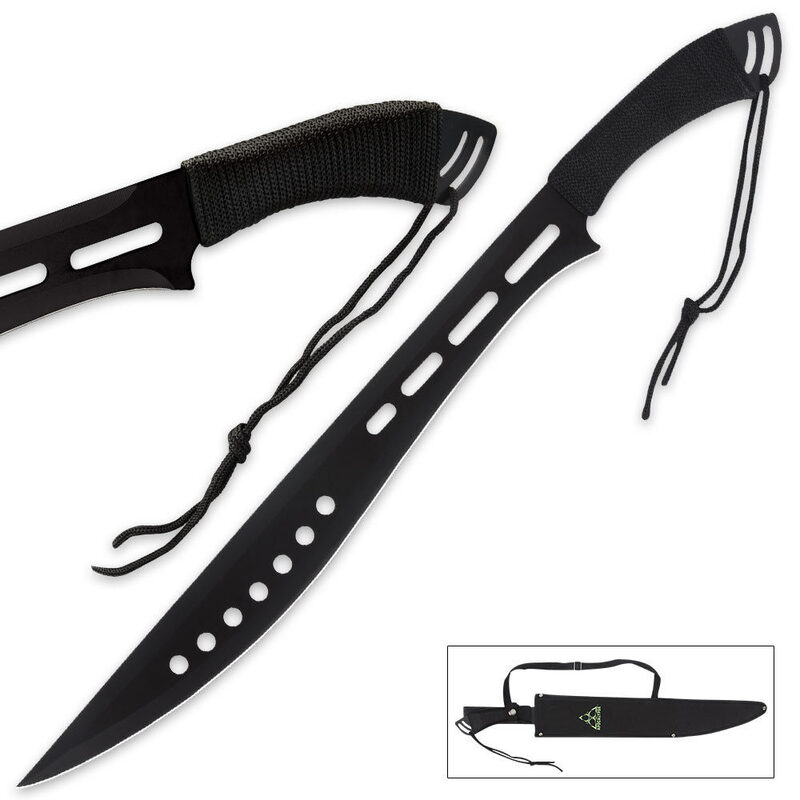 Its pretty light, ships really sharp, and is one cool looking machete. Its a pretty badass blade. I only wish the sheath had a back strap to carry it on my back. But other than that, it's definitely worth the buy. Its a great good sized blade and extremely sharp. i know its sharp because as soon as i pulled it out of the sheath the handle slipped and i cut my thumb all the way open. Only thing i dont like is the way they wrapped the cord on the handle, it makes it very slippery when swinging but you can easily take off the cord and replace it or rap it in a way to give more grip. Awesome, very sharp, lightweight and well worth the pricetag.